Das Denkmal f黵 Julius Cohnheim auf dem neuen Johannisfriedhofe zu Leipzig. Zur Erinnerung. Leipzig : Julius Klinkhardt, 1888. Description : printed paper wraps, bt, [1 l.] pl., �p. ; illus: 1 phot. ; 22.3 cm. 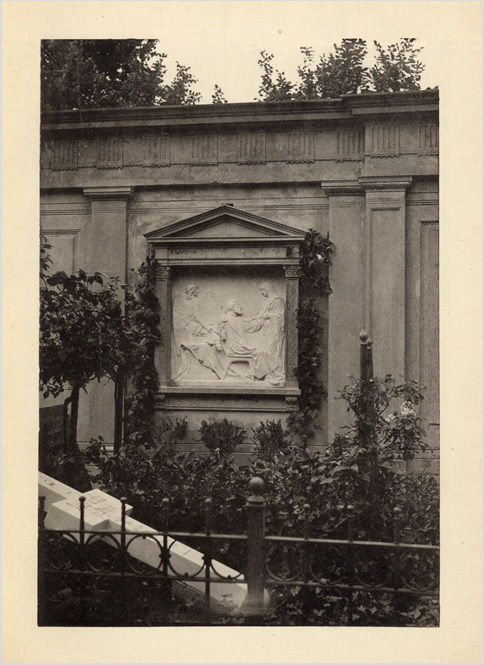 Photograph : collotype of the Cohnheim monument. Subject : Medical biography — Julius Friedrich Cohnheim (1839-1884). Lead author caption: Ansprache von Prof. W. His. Author caption: Ansprache von Prof. O. Ribbeck. Author caption: Ansprache von Prof. B. Fraenkel. Printed ephemera, one copy located in OCLA. From 1878, Julius Cohnheim chaired the department of pathology at Leipzig University. His colleague, Wilhelm His, chaired the department of anatomy and was treasurer of the committee that funded and raised the monument to Cohnheim at his gravesite in the Neuer Johannisfriedhof in Leipzig. The commission of the sculpture went to Rudolph Siemering (1835-1905), who was responsible for many public monuments in both Germany and America, most notably the massive equestrian bronze of George Washington at the entrance to the Museum of Art in Philadelphia. Unfortunately, the Cohnheim monument was lost when the cemetery was razed and turned into a park in the 1970's. Also addressing the unveiling were professor of philology at Leipzig, Otto Ribbeck (1827�98), and an old friend and research partner, the eminent otolaryngologist Bernhard Fraenkel (1836-1911).